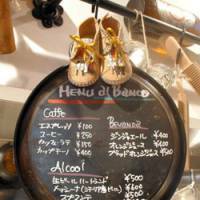 Tokyo’s love affair with Italian food and drink shows no sign of abating. In the bad old days — and they weren’t that long ago — finding a ristorante that was even half good might entail a trip across town and considerable expense. Now we’re spoiled rotten for choice. Any neighborhood worth its salt has its own trattoria, osteria, enoteca or vineria, or at the very least a specialist Neapolitan pizzeria. And they’re serving much more than generic, tourist-level pasta. Pick a region of Italy: The chances are you will find its cucina somewhere in the city. Sicily is well represented. 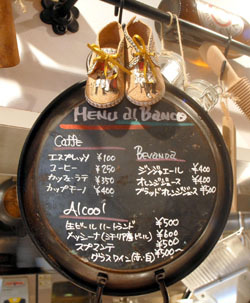 So too is Sardinia, thanks to Tharros, a cheerful, bistro-style eatery in the heart of Shibuya. Tucked away on the ground floor of a new building behind Tokyu Plaza, Tharros opened in late 2007. Perhaps to avoid scaring people off, it merely terms itself a “taberna & bar Italiano.” And indeed, you could easily just drop in for a simple pasta dinner, perhaps with a glass of generic red vino, without being aware that it has any regional affiliation. But you would be missing out, because Sardinian food is outstanding and — like its history and culture — quite distinct from that of mainland Italy. As the largest island in the Mediterranean after Sicily, Sardinia has long been a cultural crossroad. Influences have arrived (whether voluntarily or not) from the Middle East, southern France, Spain and North Africa. The name Tharros (for Anglophones, that’s pronounced “Taross”) is taken from an ancient port city, now an archaeological ruin, built by the Phoenicians on the island’s west coast. Unlike its namesake, there’s nothing archaic about Tharros. The display cases filled with antipasti and fresh ingredients are impeccable, as is the gleaming open kitchen. 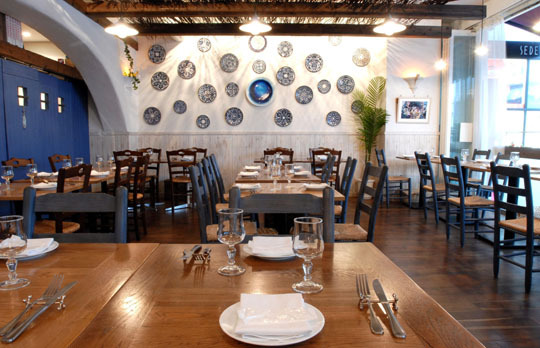 A few dried fish and salamis dangle above the counter to evoke a taberna feel. The dining room is done out in contemporary-rustic style, with blue-and-white ceramics affixed to whitewashed walls, wooden rafters spanning the ceiling and an arch across the entrance to an inner dining area. Arriving on a Friday evening in the middle of summer, we were impressed by the clamor and buzz that filled the room. The tables are packed in close together and there wasn’t a spare seat in the house. It may be noisy but at least it’s not smoky. Tharros (as is standard throughout Italy nowadays) is entirely non-smoking. There’s a special ¥6,500 set-course meal of Sardinian specialties (and also simpler meals at ¥3,500 or ¥5,000), but we decided to order a la carte. Mainly this was so we could try one of the supreme local delicacies, bottarga (preserved, dried fish roe; karasumi in Japanese) made not from the usual gray mullet but prepared from tuna roe. Salty, dense and almost translucent red, the fatty-rich roe is sliced into fine slivers and served with another rare Sardinian specialty, a flatbread known as pane guttiau. This traditional shepherds’ wheat bread, also called pane carasau, is the size of an Indian chapati but baked crisp like a papadum. If you order the bottarga, it is is served plain, with butter on the side. We found them so moreish we ordered extra rations, which came seasoned with olive oil, salt and rosemary. We also enjoyed another distinctive antipasto from Sardinia, tuna “prosciutto,” fine slices of tuna belly that have been cured much in the same way as Parma ham. Like the bottarga, this is also part of the Sicilian tradition, and Tharros serves a selection of Sicilian appetizers (¥1,200 for five small plates). The pasta course is equally interesting. The selection of homemade pastas at Tharros includes culurgiones, a type of ravioli stuffed with creamed potato, cheese and mint; and gnocchetti sardi, mini gnocchi prepared with goat’s milk pecorino cheese and covered with a thick ragu sauce. 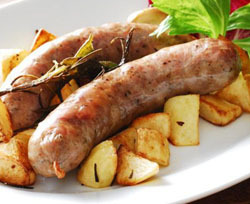 Delectable but hearty, this is a dish worth sharing between two, unless you are ravenously hungry. And then there is fregula, Sardinia’s take on couscous. Much coarser than the North African version, the individual grains could almost be mistaken for pearl barley. 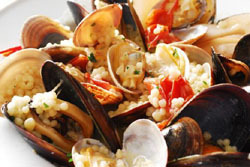 The classic preparation offered at Tharros is sa fregula ai frutti di mare (¥2,200), topped with an appetizing selection of clams and other seafood and lightly cooked cherry tomatoes. 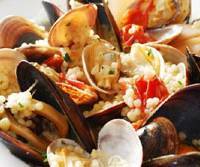 Food like this demands good wine, and the wine list at Tharros offers plenty of choice. From Sardinia alone, there are a dozen each of white and red, supplemented by equal numbers from Sicily and mainland Italy. Most are well priced, in the affordable ¥4,000 to ¥6,000 range. We enjoyed the excellent Cala Silente, a fragrant white made from the indigenous Vermentino grape. Among the main courses, the pan-fried swordfish is always reliable. 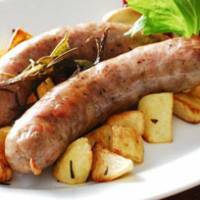 Nor can you go wrong with the homemade salsiccia sausage (¥2,000), served with oven-baked cuts of potato. But we were less impressed with the lamb (¥2,600 for two small chops). They were flavorful but fatty, even though they had been cooked in authentic style over a piastra griddle. 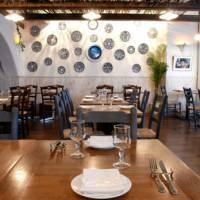 But overall, the cooking at Tharros is more than merely “authentic” in its ingredients and technique — it tastes right too. This is testimony to head chef Keitaro Baba. He’s the dude wearing Johnny Cash black who you may spot back in the kitchen. Formerly at La Scogliera, a seafood-specialist ristorante in Akasaka, Baba spent several years working his way around Italy, including long stints in Sardinia, and still makes regular return visits to hone his recipes and gain inspiration. To our knowledge, Baba is the only chef in Tokyo preparing the classic Sardinian dessert known variously as seadas or sebadas. These pastries are deep-fried until their cases are golden-crisp and the filling of cheese is molten and creamy. Served sprinkled with castor sugar and a drizzle of honey, one of these is substantial enough to share between two. However, the chocolate and semolina pudding (¥750) you will want to hog all to yourself. Perhaps the best thing about Tharros is its lack of formality. You can settle in for a full-scale dinner with wine, grappa and all the trimmings. Equally, you can treat it as a place for a light meal after work, shopping or a movie. Or you can just drop in for an aperitif or two at the counter, perhaps with some appetizers from the special bar menu. Lunch: 11:30 a.m.-2 p.m., Sat. from noon (last order 2 p.m.); cafe: 2-3:30 p.m.; dinner 6 p.m.-midnight (last order 10:30 p.m.), closed Sun. From Shibuya JR Station (West Exit), cross the bus rotary to Tokyu Plaza. Go down the street next to the Bank of Yokohama, then take the first side street to the right (toward Mark City). You will see the entrance to Tharros on the left after about 20 meters.